Minimalist wallets (a.k.a slim wallets) have risen in popularity in recent years. Men are streamlining and downsizing their wallets in an effort to carry less. In this guide, we’re going to review the best minimalist wallets for men, their pros and cons as well as other quality indicators and metrics. In fact, two decades ago, cash was king and business cards were prevalent. Bulky wads of cash have been replaced by chip-enabled debit and credit cards, and business cards are falling by the wayside. If you are looking for a new slim wallet that will hold all of your cards, this guide will show you the best slim wallets for men on the market today. Why Choose A Minimalist Wallet? And The Best (Minimalist) Slim Wallets For Men Are? And The Best Minimalist Wallets for Men Winner Is? There are a lot of factors to consider before purchasing a new wallet. Your budget and price range have a direct impact on the type of wallet you choose to purchase. The brand name of the wallet and materials used to construct it are also important to consider. 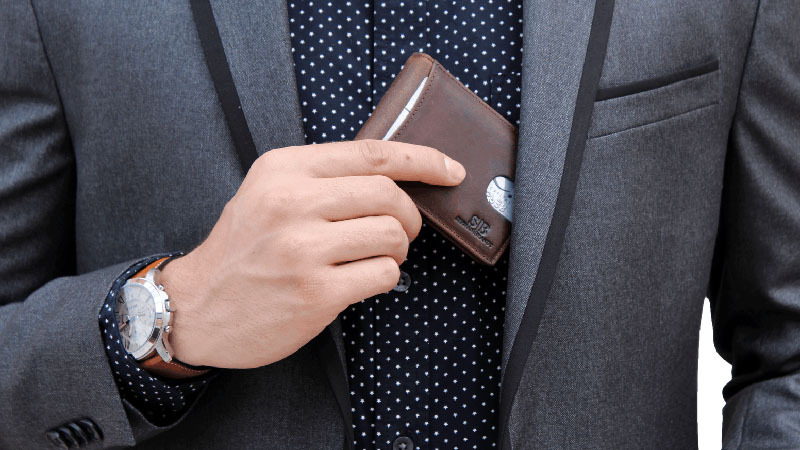 Furthermore, the unique features and design of the wallet, as well as the color, need to be taken into consideration when choosing from the various slim wallets for men available in the market. Arguably the biggest decision affecting your purchase of a new minimalist wallet is the amount of money you would like to spend on it and what brand names you enjoy. Also, many men purchase a slim wallet based on its features, look, design, price and color; but a large number of men are also very loyal to a particular brand. If you love brand names and have an unlimited budget, you can invest in a luxurious calfskin leather wallet that is hand-crafted and made to last. On the lower end of the budget, you may be looking for a wallet made from ripstop nylon that will last you for a season or two. The best minimalist wallets for men offer function, fashion and features that make them stand out from the crowd. From RFID technology to built-in money clips and clear ID windows, functional features are just one of the many ways that top-selling slim wallets for men stands out from their competition. The best minimalist wallets for men will differ greatly from what you prefer. Some men like slim wallets with a tri-fold type of organization, while others enjoy a slim and streamlined card case with just a few card slots. Some men are drawn to a particular color when it comes to selecting the best minimalist wallet. They prefer a wallet in a neutral color that will complement their work wardrobe, for example. On the other hand, other men like their slim wallets in darker colors because they do not show dirt as much as lighter-colored wallets. Likewise, material is also an important feature to consider. Hand-crafted leather wallets, with reinforced stitching, will last far longer than a nylon billfold. Some men like to shop for a minimalist wallet with quirky insignias, sports logos or graphics from their favorite television show or movie. The best slim wallets for men will offer streamlined looks and silhouettes with lots of functional features. In addition, many men are choosing minimalist wallets because they are simply tired of carrying around a bulky, overstuffed wallet that is full of receipts, unused cards, ticket stubs and notes on little slips of paper. As a matter of fact, if you do a lot of traveling for business or leisure purposes, a minimalist wallet gives you security and peace of mind. You can put it in your front pocket while at the airport or on the subway to prevent theft. Not to mention, some of the best minimalist wallets for men are ones with has a secret storage compartment. You may prefer a wallet with a detachable money clip, secret pocket or slide-out features that give you more bang for your buck. Therefore, minimalist wallets force you to carry around only the essentials. Thus, you will not have to carry around a weighty wallet anymore with a slender style. Equally important, slim wallets for men are virtually undetectable in your pocket, so you minimize the risk of being a victim of theft with a minimalist wallet. Additionally, the best minimalist wallet for men is one that offers RFID protection and is constructed from lamb leather. Nevertheless, you may have very different requirements when it comes to selecting the best slim wallet. Here are 10 of the best (minimalist) slim wallets for men available on the market today. When it comes to selecting the best minimalist wallet, each person will have a different set of criteria and characteristics that they deem important must-have features. When you compare these top-rated slim wallets for men choices, they have a lot of similarities that make it hard to choose a clear-cut winner. However, taking into consideration the price, available color choices, RFID protection, overall style, the money-back guarantee option and amount of cards and bills it can hold, the NapaWalli Genuine Leather Magnetic Front Pocket Money Clip RFID Wallet wins by a small margin. And this is based in part that it has four safe earth magnets; whereas most wallets with this technology only have two. Also, it comes in a wide variety of colors and is offered at a modest price point. It definitely sits at the top for the best slim wallets for men; but it may not be the best minimalist wallet for you if you prefer non-leather options. What’s your take? Do you own any of these slim wallets for men? Let us know your thoughts and suggestions in the comments below.